The iPad has always been a fantasy, and even as the device is more powerful and beautiful than it’s ever been before, I can’t bring myself to understand why most people would ever want one. I remember sitting in a newsroom nearly a decade ago as extremely smart and well-meaning editorial executives told a group of magazine staff about their plans to launch for a yet-unannounced iPad. This was the solution to declining print circulation! We would make magazines for the iPad! I don’t need to tell you that magazine apps for the iPad didn’t exactly pan out. Depending on the user, for most, the iPad is basically either a large phone you use to browse the web extra big or a minimally productive laptop replacement you poke at on the go. But I think that moment in 2009 is reflective of how stoked people were about the possibilities of the tablet computer. Perhaps the enthusiasm was partially residual excitement about the iPhone, which just years before the introduction of the iPad had entered the world and set in motion a complete revolution. Jobs and friends did it once, maybe they could do it again. Now I’m all about nerding out on design, especially when we’re talking about real functional, utilitarian considerations, but here we’re talking about the corners of a damn display. This is an irritating thing designers do, especially when it comes to touch devices. They stray from the ways design improves how you use things to effusive monologues about the immediacy and intimacy of experiencing them. It’s not just Jony Ive—a few years ago I ribbed Microsoft hardware chief Panos Panay for a similarly feverish description of Surface hardware. The trouble is, I think, that it’s very hard to explain the largely niche utility improvements of devices like the iPad Pro (and, yes, the Surface Studio Panay was on about) to regular people. 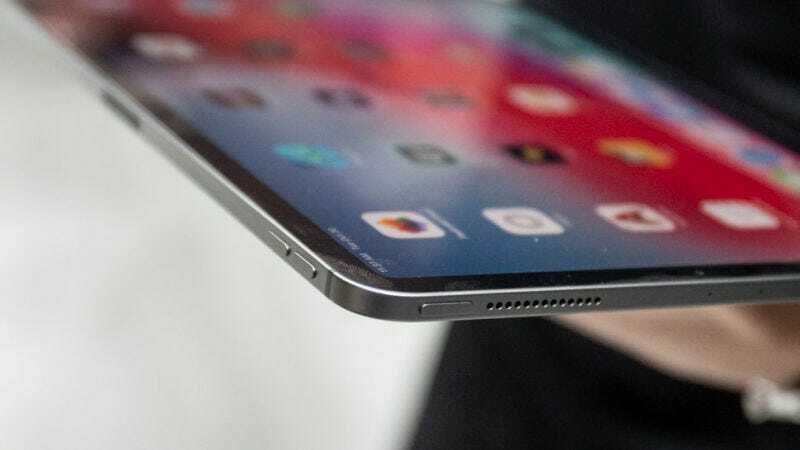 The Apple presentation introducing the iPads earlier this week was targeted at “creative” people who have demanding needs when it comes to things like stylus performance, CAD rendering speeds, and sharper more vibrant displays. DJs, architects, graphic designers, and other rarefied iPad users should be very excited. Most of us are not these people! But maybe selling the devices to regular folks is contingent on convincing us that we’ve got a deep well of creativity hiding within that will be unleashed thanks to the latest processor upgrade; or that the design of the new iPad is so perfect, you’ll experience transcendence while checking email in an airport lounge. For my continued skepticism about the utility of the iPad, Apple indisputably sells millions of these things. For better or worse, there are millions of people who will rush to buy the latest product Apple releases, even if it will only be a very fancy couch companion. And though I’m annoyed by the aspirational creativity that drives many people to buy expensive products they won’t fully utilize, I fully acknowledge that there are thousands and possibly millions of people who really get the most out the iPad. I guess what I’m saying is I just don’t know how I would use one. Maybe I’m just lame?